The programme leader or director role is crucial to higher education institutions’ core business – the delivery of programmes of study. However, programme leadership is little researched or defined. As a frisky SEDA jisc-mail exchange in the Autumn of 2017 evidences, there is an appetite for better understanding how to support and develop the personal effectiveness of those responsible for programme leadership. In response to this we accelerated our plans to develop a Special covering Programme Leadership. The Special offers insight to the role, examples of programme leadership in practice, and ways to support programme leaders in executing their responsibilities effectively. 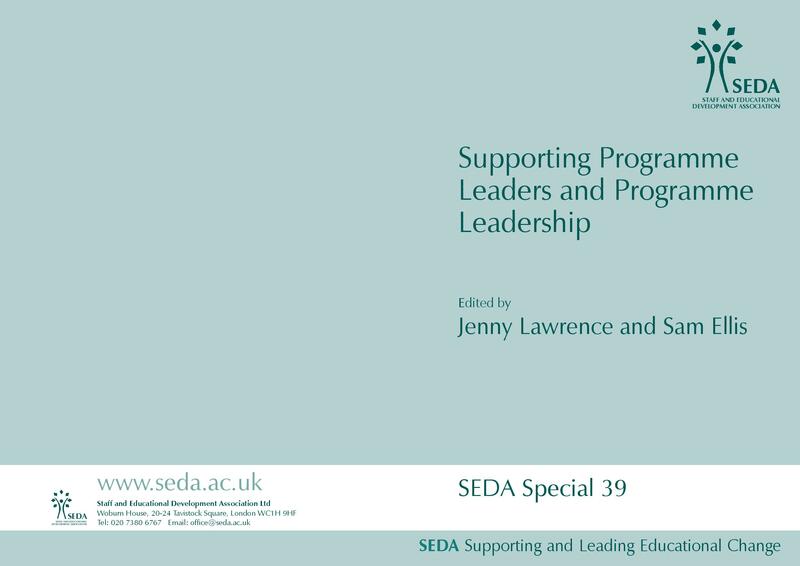 We hope the SEDA Special format (a 20,000 word edition made up of concise chapters and case studies) suitable for the busy educational developers supporting programme leaders, HE leaders developing the programme leader role, and programme leaders themselves. The responsibilities of the programme leader include academic leadership (creating a unified and coherent academic programme made up of a collection of modules), and the leadership of academics (supporting peers in meeting their specific responsibilities across the programme). Integral to both is the importance of creating productive and positive inter-personal relationships across a wide array of colleagues: quality and administrative officers, educational developers, academic peers, senior academic leaders and of course students. These responsibilities are far reaching, yet programme leaders often lack formal managerial power. Personal effectiveness, then, is important to the role of the programme leader, and to the success of the programme. These issues are all explored within the Special. The Special opens with a delineation of the programme leader role from Rowena Senior. The interrelationship of academic leadership and the leadership of academics is explored in Kathleen Quinlan and Orkhon Gantogtohk’s account of building multi-disciplinary programmes. Next, Ruth Whitfield and Paul Hartley address the specific challenge of achieving coherent assessment across a programme. Carol Morris and Alec Goodyear’s case study is illustrative of a successful programme-team approach to reshaping assessment across a programme. Focus them moves to the leadership of academics. Sarah Moore explores the importance of collegial relationships to the programme leader role, followed by Sam Ellis and Alison Nimmo’s outline a refreshing approach to supporting the development of programme leaders, with a clear focus on personal effectiveness. The special closes with a case study from Sue Eccles, Julie Barber, Corrina Lailla Osborne and Kar Stanton on Bournemouth University’s credit-bearing CPD provision for programme leaders. Jenny Lawrence is an Independent Consultant in Academic Practice. Sam Ellis is a Senior Lecturer in Academic Development at Glasgow Caledonian University.